No matter, how many times I visit the Western Ghats, I could go again and again and again. The entire area is so vast and there are so many places in it and I've been there several times and still I'm yet to see Mudumalai, Periyar, Srivilliputhur, Sahyadri and more!!! Kabini is just at the edge of Nagarhole and Bandipur National Parks, which belongs to the Nilgiri Sub Cluster of Western Ghats, UNESCO World Heritage Sites! And at Kabini, at the banks of the Kabini reservoir is the Orange County Resorts! The whole look & feel of the entire resort is so entangled with the nature & culture around it! The architecture & masonry is almost true to the local village style but with all modern amenities. The best example I could give is, all the lighting here are hurricane oil lamps & candle lamps, altered to fit electric bulbs inside! No disposable waterbottles or plates are used and the masonry looks more like local huts with wooden structure & thatched roof etc. Spread in an area covering 18 acres, this just has 37 rooms! 8 are Pool Huts and 29 are Jacuzzi Huts! Unlike its counterpart in Hampi, the entire space is more like a community living than a hotel! It absolutely doesn't have a hotel feel to it and its one of the best hotels I've stayed so far! The huts are spaced away from each other. All the buildings have only the ground floor and no terrace as well. Even the newspaper socket at the doors of the rooms is a hollow bamboo piece (didn't I say we're cocooned by nature?)! The switches are retro, very similar to its counterpart in Hampi! The doors are made of wood with bamboo/cane reinforcement. All the furniture inside are also made of bamboo & wood. The lampshade are handmade with local material. The blinds are Kora grass mats! Drinking water is via RO tap just like in Hampi. Sized at 2400 sq.ft, the Pool Huts are the epitome of luxury! As the name says, it has a private swimming pool in it! As soon as you enter, there's a 21sq.m sized swimming pool, complete with 4 lounge chairs (yes, the first pic of the post is also this pool)! Since all buildings have only the ground floor, and since the pool huts have a high compound wall around the open to sky pool, there is complete privacy!!! That's a luxury that I can't have in my own house. The sky lit areas in my own house can be seen from the neighbour's terrace, but not here!!!!! The interior of the hut has 2 rooms in it - the living room and the bedroom. Both the room have river facing French windows that brings in enough of day light! The bathroom, attached to the bedroom has a bathtub, a shower, 2 sinks and a door that directly leads to swimming pool again!!! 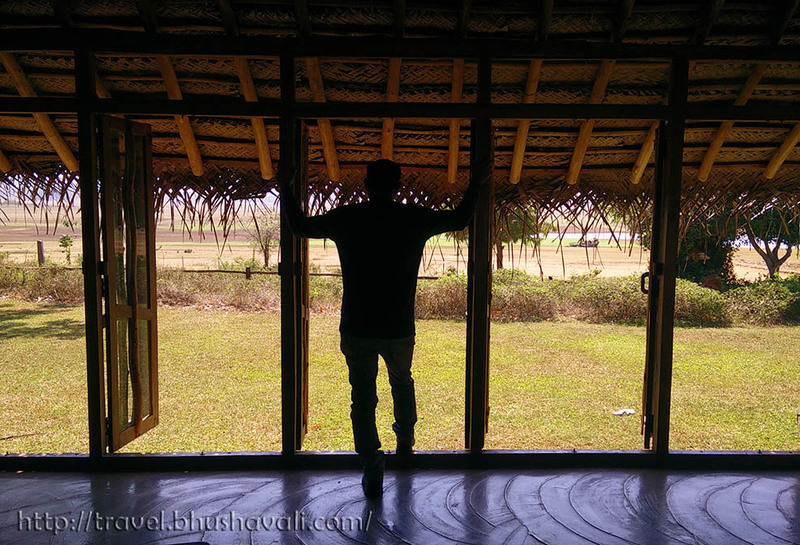 The living room has a backdoor as well, complete with a portico with lounge chairs, that has a view of the Kabini River! I spent an entire evening sitting here, watching the river over sunset, and continued much after sunset, in pitch dark atmosphere! The living room is equipped with a cafe, mini bar, TV, seating arrangements & dining table as well! The bedroom is a huge king sized bed, with an AC, Fan, bedside tablelamp etc. The best part is, you could choose the pillow filling that you want! They give you 4 options!!! That's called literally spoiling the guest! The Jacuzzi Hut (sized 1200 sq.ft) on the other hand is almost like a typical village home. All the facilities are almost like Pool Hut, but this doesn't have a river view and instead of a huge pool, here's a small open air jacuzzi! The wall hangings and table decor all over the hotel are also made of wood, jute, seeds etc. As I said when you're in the midst of nature, you're practically renting a space that belongs to wildlife, from the wildlife, for a few days! So, if you leave your room windows open, you might get to some insects & birds are visitors! The restaurant is always filled with sparrows and some even live in the thatched roof over your head!!! That's going really long. Let me break here and continue the review in the next post! P.S: I was invited by Orange County Resorts, Kabini to stay and experience the hotel for review purpose, however the opinions are my own and this post does not to advertise the product/service. This place looks like the perfect getaway. It's so lovely that you get to rediscover different parts of the places you've already visited. Here's a great quote: “You can never visit the same place twice. Each time, it's a different story. By the very act of coming back, you wipe out what came before" - Maureen Johnson, The Last Little Blue Envelope. I like this eco villa. It looks like that it is located in Easter Island. It feels like that you are connected with nature. I would love to visit this place someday. Cocooned by nature indeed! (great way to describe this resort, by the way). I lived in Ahmedabad for a few months and took a weekend road trip do Diu, but I obviously have a lot more of the country to explore. This place looks really nice and relaxing. I'm keeping this blog post as reference! Wow, what a lovely Place this seems to be. The Perfect retreat to get away from a hectic and stressful life. Would love to relax here for a week or two. Thank youfor sharing this Place With us. Orange County Resorts Kabini looks really nice. Is it situated directly on the river? I bet that is lovely. 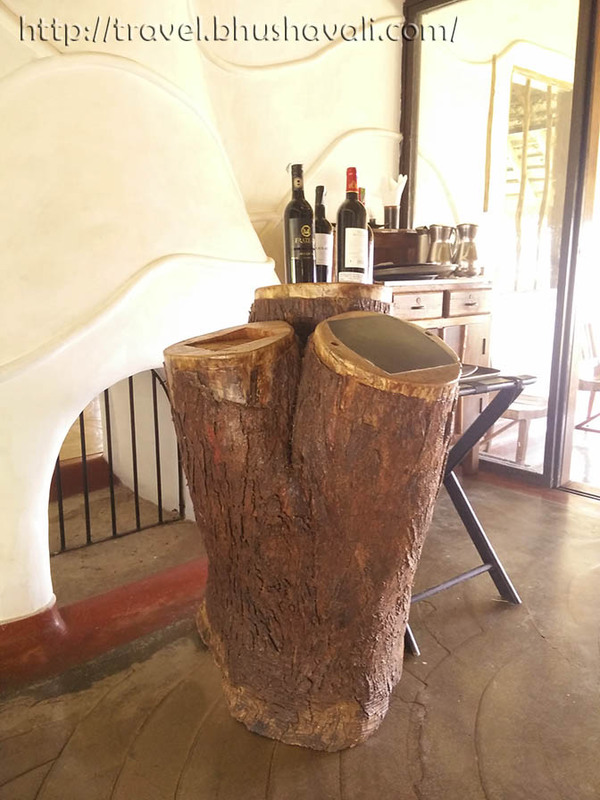 It's nice that they are very mindful of blending in with nature and giving the hotel an authentic village feel rather than feeling like a big commercial hotel. Also, the pool suites sound amazing! Thanks for sharing your experience! I know you love UNESCO World Heritage Sites! I've actually started paying more attention to what is and what isn't a UNESCO world heritage site since reading your blogs! The Orange County Resorts in Kabini looks like the perfect place to stay and enjoy the ghats. They have so much attention to detail, such a luxurious resort! Having stayed in Maharashtra for 7 years, I love western ghats. Off late a friend of mine was in Kabini and she had amazing sightings of leopards and tigers. Since then I want to go here. Orange County seems a good option. I like the fact that they have used natural raw materials to construct the property. Oooh the swimming pool and the king size bed look so welcoming. Glad you enjoyed your trip and shared the experience. If i have a chance to visit India some time I will definitely have a look at Orange County ! This is a great place for a nice family vacation or an office outing or team building event. The amenities look ample and the environment is so clean. This resorts looks amazing. I just want to spend an entire afternoon in that pool. That towel elephant is just adorable. I wish I had someone to make one for me every day at home. The resorts looks neat and clean. Thanks for sharing your review about this resort and their other details. Your post really helps us travelers. Thanks! Looks really authentic and beautiful and the swimming pool sounds awesome! This must have felt like a really great stay being one with nature. I think I'd be spending most of my time in the jacuzzi and pool huts. Oh wow! Those rooms, especially the pool and jacuzzi rooms, sound amazing! I would love to go there sometime. Wow. This is great journey. The travail have let learnt and discovered many things. You would have fun and experience of the places. "Cocooned by nature" - you couldn't have described it better! This looks like such a great place to stay, totally away from the normal hustle and bustle of India. I love the idea of the Pool Huts! 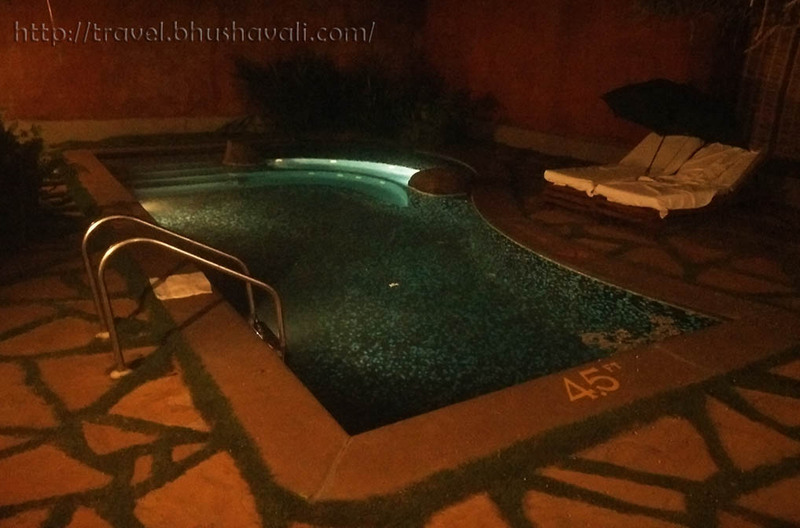 The amount of times I've stayed at a hotel with a pool in India and not felt comfortable taking a dip, even in 100000 degree weather is unreal. A private pool would be the perfect solution! Yes, truly there's such a place that we always want to go back and explore more of what it has to offer. This resort is really such great place to stay. I like the simplicity it owns, but very elegant and clean. Th native design makes it more beautiful and enticing. I would love stay here if i get the chance. Thank you so much for sharing! This looks like such an awesome place to stay! The huts are adorable. The private pool is great added touch! I definitely want to stay here! I like the concept of the total ecofriendly accommodation, starting from the bedroom and everything. It helps to brings peacefulness and calm approach to every guest. PS. Am now tempting to look for that similar lamp! It's gorgeous! The place really gives you a countryside feel, which is really among the things people look for in a vacation. It feels refreshing and relaxing. I could imagine why you would want to keep coming back. The resort's amenities are so lovely and perfect for relaxing. I could picture myself relaxing here for the weekend! The nipa huts remind me of a lot of beach resorts here in the Philippines. The private swimming pool looks like an awesome place to relax or swim. What an awesome place to stay! Love your pictures and how you said it felt as if you were entangled with nature. I like how the decorations were made from wood too! Looks perfect to escape from some of the more manic places in India. What a lovely experience! Surrounded by nature! The pool hut sounds like a wonderful way to beat the heat. Love the decor and the retro switches! Lovely property. Somewhat reminded me of my recent Satpura trip because that property was also designed in a similar way that assimilates with nature rather than standing out. Hope other properties also follow this principle. This looks like a great place to stay. I love how in touch with nature the whole environment seems. The bamboo newspaper socket is really cool too. You could definitely relax and get away from it all here. Living in these rooms seems to be heavenly. And The Jacuzzi Hut looks so inviting, would rather have been there than in a rainy climate where I am now haha. What a beautiful place to stay I just love it! Personally I could just sit at the pool all day or look out the windows toward the river and be totally content. I love the separate bedroom, so you feel like you have some space and they are so authentic and rustic. Just seems like the perfect place! I need to go. LET ME STAY HERE WITH YOU! This sounds incredible! I think if I stayed here, I'd spend a full week rotating from the bed to the jacuzzi hut haha. Seems like quite a rustic yet luxury experience. And that too, in a wildlife haven like Kabini. I sure would love to experience it myself. I stayed in Waterwoods which I think is on the opposite bank to Orange county. Our boat man pointed it out to us and yes, I do have my eyes set on it since then. And now with your pics and description, even more! This is such a beautiful resort. Love the way the resort blends in with the nature. This has been on our radar for sometime now. Love the one at Hampi too. The rooms seem to be large and spacious. What a stunning location. The huts and thatched roofs reminded me of an African village instead of a resort. Loved it!